In April 2015, a devastating earthquake shook Nepal, killing nearly 9,000 people and injuring nearly 22,000. 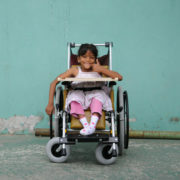 A few months after, Walkabout sent a relief container of 100 wheelchairs, with the hope of restoring dignity, freedom and independence to the people who had lost so much. The disaster may have been almost two years ago, but its presence is still being felt across the country. 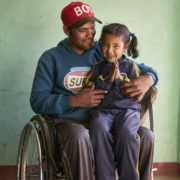 That’s why last week, we returned to Nepal to distribute 250 chairs to people with spinal cord injuries, alongside our local partner, Spinal Injury Rehabilitation Centre (SIRC). Many people live extremely remotely in Nepal, and often those we met had travelled for many hours (and in some cases, even days) to receive their chair. Tulashi, pictured above, was injured when she fell out of a tree 9 years ago. She paid her neighbour to carry her for three hours just to reach the closest road to her village, and then spent two days on three buses to reach the centre, where she received a chair that means she no longer has to spend all of her time isolated and alone at home. 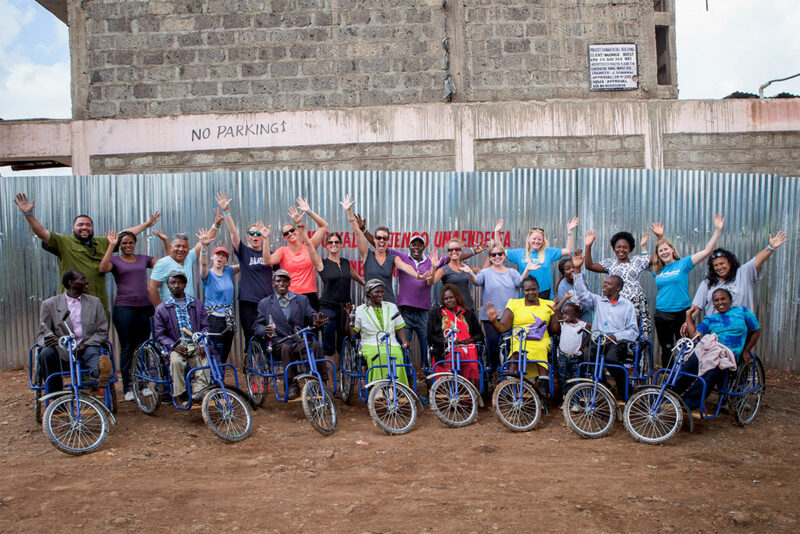 We spent the week building, fitting, and modifying 250 rough terrain wheelchairs – each of which represented a world of opportunity to its recipient; whether it was the possibility of starting a business, returning to work, or even just being able to leave the house alone to go to the market. In November, Walkabout carried out our first ever distribution in Ecuador, where we travelled to some of the areas most affected by the devastating earthquake earlier this year. We distributed 280 chairs to children and adults in need, lots of whom had lost their family members and homes in the disaster. But in spite of the overwhelming hardship that has recently hit the lives of so many of the people we met, the week was filled with smiles, excitement, and gratitude. We want to say a special thank you to our local partners, Fundacion Vista Para Todos and Hope Haven Guatemala, whose skills, local knowledge and passion made this distribution such a success. None of this would have been possible without your support. If you would like to donate to Walkabout so that we are able to continue embarking on life-changing distributions like this one, simply click on the ‘donate’ tab above. 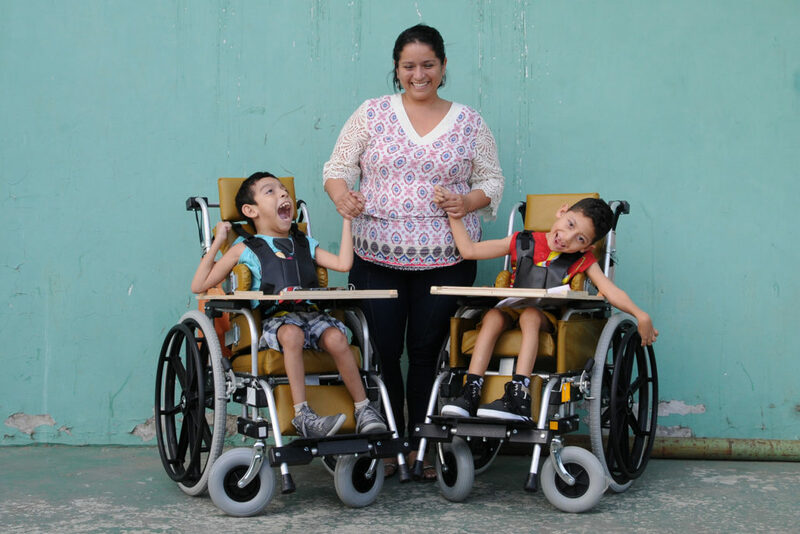 In October 2016 Walkabout travelled to El Salvador to distribute 250 paediatric wheelchairs. Several of the children we met had been spinal cord injured as a result of the gun violence that has plagued the country for so long. The capital, San Salvador, is considered the deadliest city in the Western Hemisphere. Alicia, one of our recipients, was caught in a crossfire between two gangs when she was just a year and a half old, leaving her paralysed from the waist down. She is now 8, loves pizza and learning English, and is an incredibly intelligent and independent little girl. 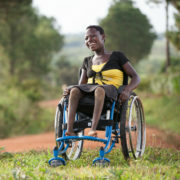 She was delighted when we gave her a new wheelchair, as hers was far too small and falling apart, and insisted on getting into it without any help! We never cease to admire the strength and resilience of the children we meet on our distributions. 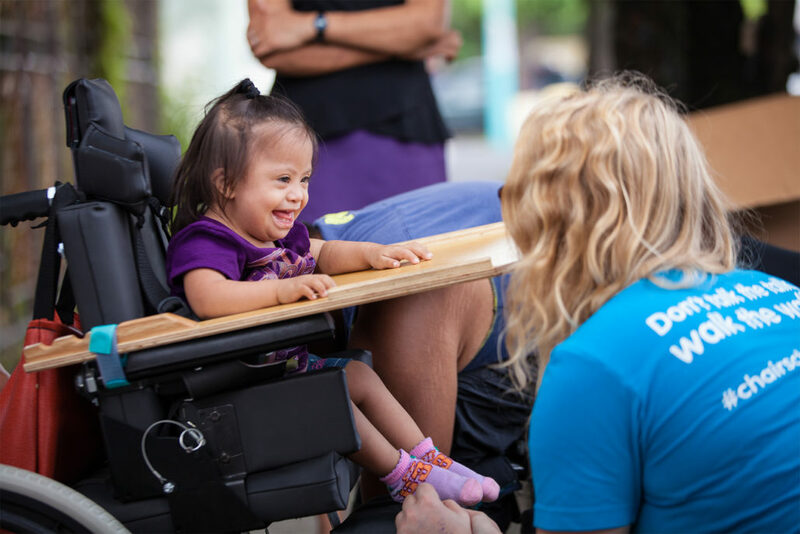 We want to say a huge thank you to all our donors, to our local partner, Fundación Red de Sobrevivientes, and to the team from Hope Haven Guatemala, many of whom are wheelchair users themselves and travelled all the way from their country to help us fit all the chairs. 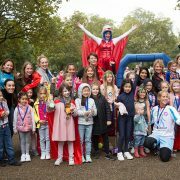 5th Annual London Walkabout – Best ever! 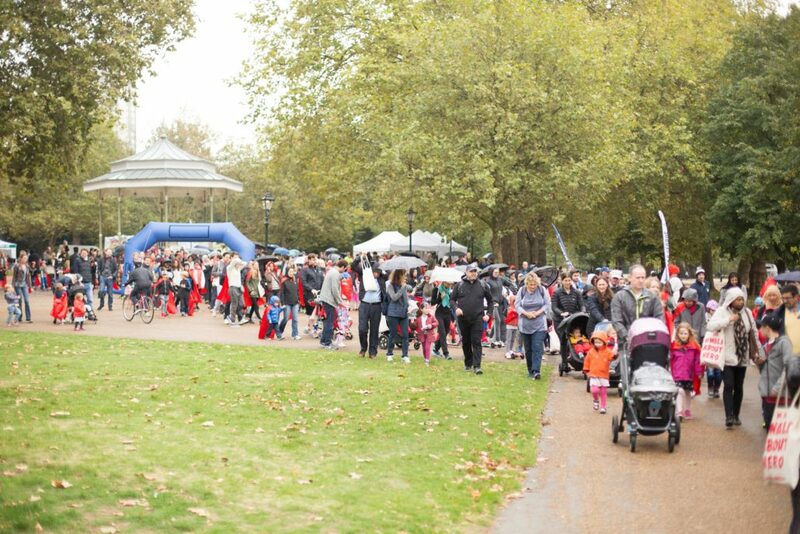 On Saturday 8th October, we held our 5th Annual London Walkabout in Hyde Park. As promised, it was our biggest and best London Walkabout ever, with over 1,300 people buying tickets (surpassing all previous Walkabouts!) to walk for those who can’t at our flagship fundraising event. In spite of the typically British weather (all four seasons in one day! 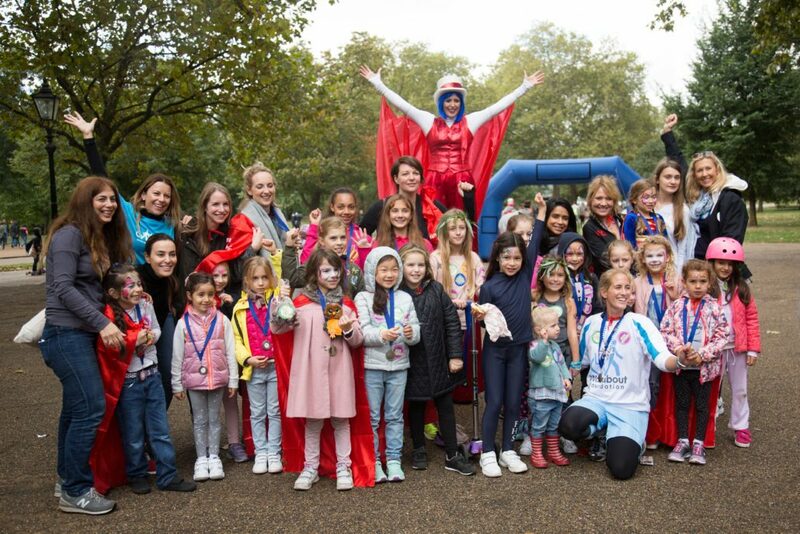 ), spirits were high, and all the dynamic marquees, activities, picnic and goody bags were enjoyed to the full by all – even the sun came out just in time for the walk! We want to say a HUGE thank you to each and every person that helped make this event such a success: from the incredible mums in our committee who put so much effort into creating the awesome marquees and selling tickets, to all the corporate and individual sponsors who donated to the event, to every single person that bought a ticket and attended the walk. 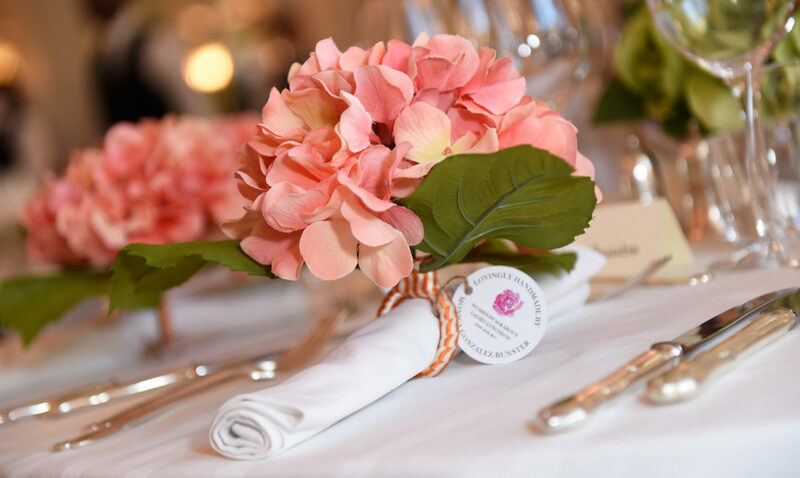 All of this work, support and dedication meant that we raised an AMAZING AND RECORD BREAKING £100,000 NET – every penny of which will go towards restoring dignity, freedom and independence to people all around the world. None of this would have been possible without your superhuman efforts and on behalf of all those who will benefit immeasurably from your kindness, we thank you from the bottom of our hearts. If you were unable to attend the walk but would still like to donate to our cause, simply click the ‘Donate’ button above. 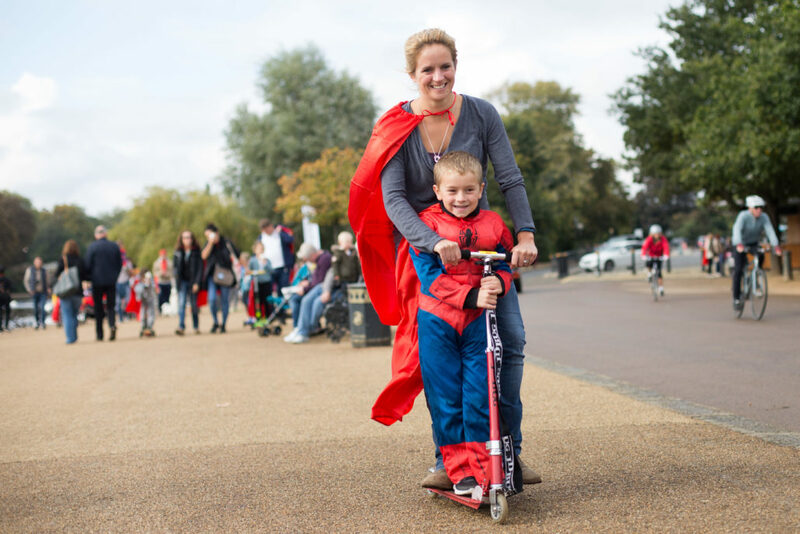 And stay tuned for the official London Walkabout 2016 video – starring some incredible #WalkaboutHeroes! https://www.walkaboutfoundation.org/wp-content/uploads/2018/05/Img1-web.jpg 667 1000 Tiago Silva https://www.walkaboutfoundation.org/wp-content/uploads/2018/05/walkabout-foundation-logo-black.png Tiago Silva2016-10-08 11:54:122018-06-20 15:50:555th Annual London Walkabout - Best ever! This past June, Walkabout travelled back to Jinja, Uganda for the third time. 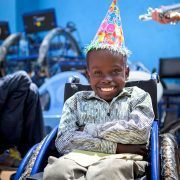 With our fantastic partner, Soft Power Health Clinic, we have now distributed over 600 wheelchairs in the region and for the first time ever, we brought and distributed 30 tricycles (‘trikes’) alongside 200 wheelchairs. 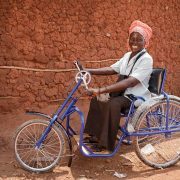 Trikes are exceptionally useful for those people with disabilities who have a need to travel long distances to get to school, work, and other villages. 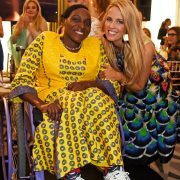 During our trip, we met many inspirational individuals with both moving and uplifting stories. Today we’d like to share just one with you. 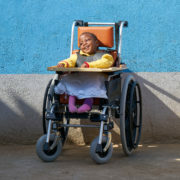 Sofia, 32 years old, contracted polio as a young girl, which left her paralysed from the waist down. She lives with her baby Quima and her parents, who support her, along with her 12 nieces and nephews. The family had a coffee plantation and were financially stable. But since their coffee crops were destroyed by a disease in the soil, feeding the family and sending the children to school has become a constant struggle. 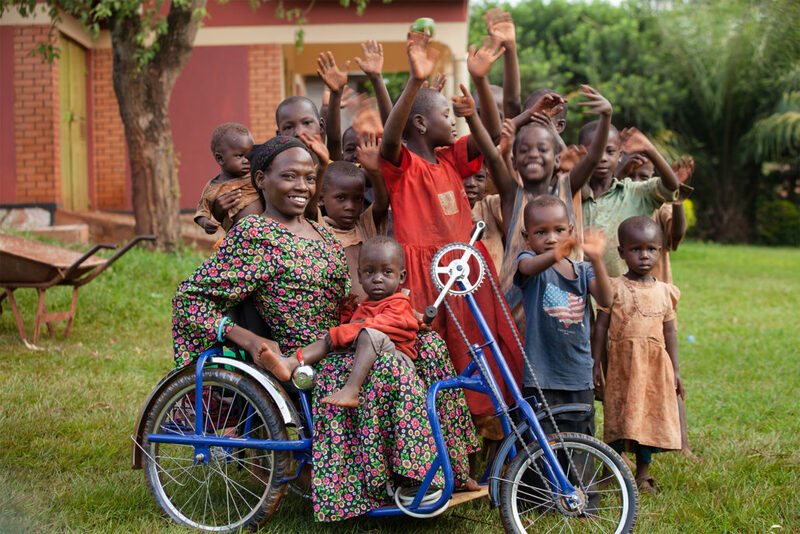 We gave Sofia a trike, and both she and her family were beyond delighted – Sofia will now be able to go out to the plantation and contribute to the family business. She’ll also be able to bring Quima with her and they’ll no longer be housebound. Sofia missed visiting her friends, leaving the house, going to prayers, attending burials (an important aspect of Ugandan life) and being a part of the community. These are all things that she is now able to do, thanks to her new trike. We are so proud to have been able to give Sofia, her family, and numerous others like her a chance. They now all have their own story to tell. The happy ending to Sofia’s story (and the numerous other happy endings we were able to bring about on this trip) would simply not have been possible without your generous and unwavering support. We thank you for helping us help others. 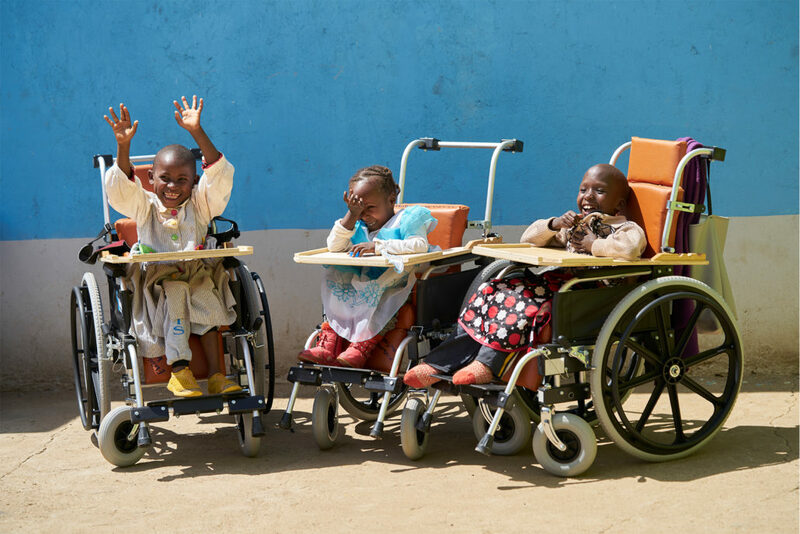 In June 2016, the Walkabout team headed back to Kenya for our third distribution at the United Disabled People of Laikipia (UDPL) clinic in the town of Nanyuki, located at the foothills of Mount Kenya. We distributed 230 wheelchairs (an assortment of Tough Riders, paediatric chairs and tricycles) and, as always, we were struck by the immense friendliness and positivity of everyone we met – from grateful recipients to the incredible local volunteers. For the first few days of our trip, we were joined by a group of 12 teachers from Greenwich Country Day School in Connecticut, USA. Their interactions with the recipients were filled with love and respect, and their energy and dedication truly enhanced everyone’s experience on the trip. After long days of fitting each recipient to each wheelchair, our Programs Manager and new staff member, lzzy and Merren, then took part in a World Health Organisation Wheelchair Provision training course. Walkabout not only funded this training for our own employees, but also for the local volunteers that we rely on in Nanyuki. We are so grateful to our partners in Nanyuki, UDPL, who always make us feel at home and whose support is invaluable. And the biggest thank you goes to you, our donors, whose generosity makes all of this possible. 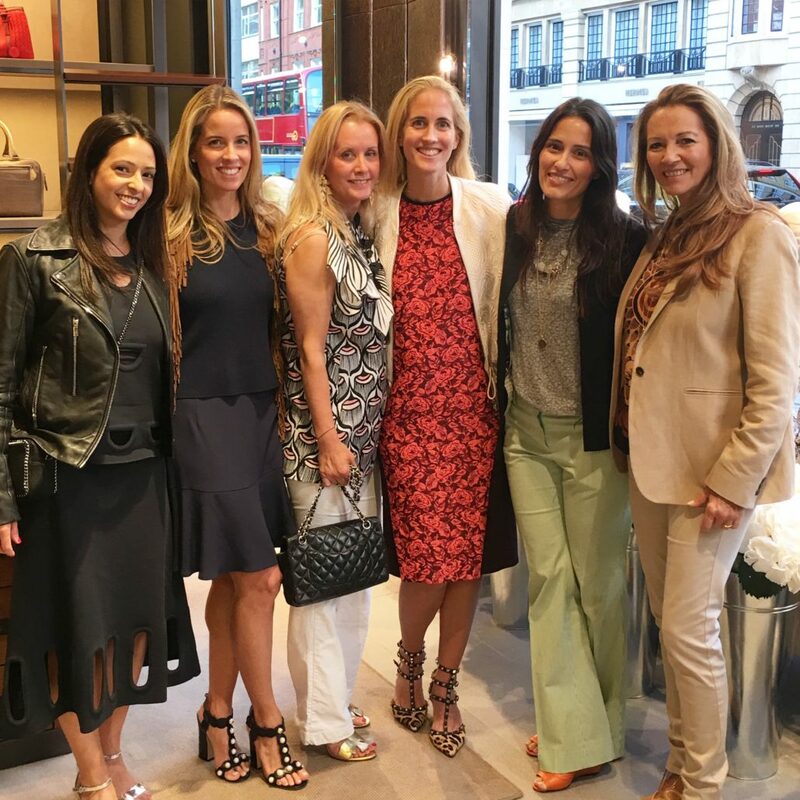 On Tuesday May 24 2016, Walkabout held their first ever collaboration with the luxury brand Bottega Veneta at their Sloane Street location, in celebration of the Chelsea Flower Show. Walkabout supporters, as well as some of Bottega Veneta’s most noteworthy clients, admired their latest Spring collection and mingled over cocktails and canapes. Our co-founder Carolina also spoke about Walkabout, our mission and vision, and thanked the entire team at Bottega for hosting us. 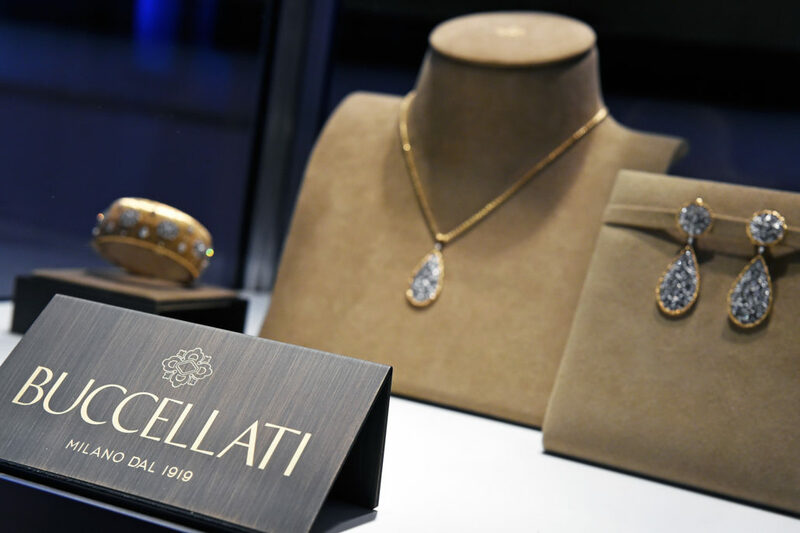 The evening was an overwhelming success with over 80 people attending and Bottega generating a staggering £60,000 in sales in a matter of hours! 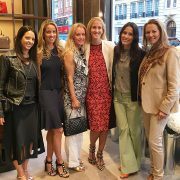 Bottega Veneta kindly donated 10% of sales to Walkabout, which, including pledges, generated more than £7,000 for our cause. 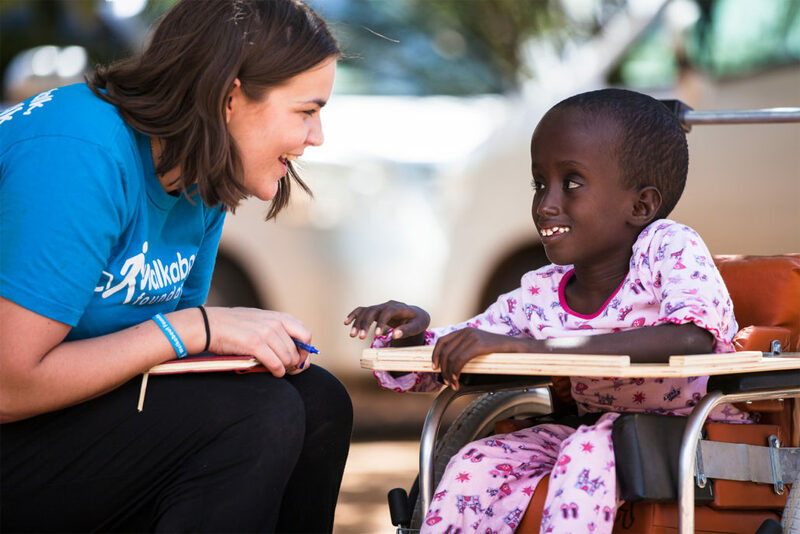 This was by far the most successful brand collaboration for Walkabout to date, which is a testament to the strength of our team and the effectiveness of our message to our donors. We are now working closely with Bottega Veneta to possibly organise an event in New York; watch this space! On Tuesday May 10 2016, Walkabout Foundation teamed up with global financial services firm BTIG, LLC for their annual Charity Trading Day. With the help of our Head of Fundraising and ex broker Zeina Nassif as well as the President of BTIG in London, Matthew Cyzer, Walkabout Foundation received over 25 nominations from hedge fund and institutional clients of the Firm, who traded both in London and New York on behalf of our cause. In addition, BTIG hosted nearly 80 all-star athletes, models, actors and actresses from film and television, journalists and other cultural icons that acted as guest traders throughout its offices worldwide. Team Walkabout really enjoyed meeting Sky Sports News presenter Olivia Wayne as well as English Cricket star Reece Tapley on the London trading floor! The day was a huge success, raising $Sm globally for over 300 well -deserving organisations that support meaningful causes. Walkabout received an extremely generous donation which will go towards our rehabilitation support programme in India this year.